Today is Day 2 of ongoing rain/hail/snow precipitation in Colorado. I love it. Don’t get me wrong — I do love the 300+ sunny days we get here, but when we have a full day of cool, gray, wet weather, I get super happy. I love the gray light. I love being cozy and comfy in the house, or in my studio. I feel creative and a little less stressed. Today I played hooky from the studio and came home to do some work and I realized that I feel a bit optimistic, even, which is unusual for me. 😉 I think I may have spring fever. This is something I don’t normally experience, but I’m kinda likin’ it! The world is my oyster, there is all kinds of potential ahead of me, etc. I am making some serious changes in my life that will allow me to actually pursue the stuff I love and take care of my family and myself at the same time. We’ll see how it goes and when I have something to report, I will share here. Oh! I guess I should share some of those minty fresh springtime thoughts, huh? I am not a gardener, but I really want to plant some stuff in our backyard to sort of block out the neighbors and add some whimsy. 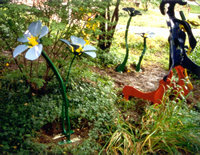 Trees, flowering shrubs, painting the fence and creating some found-object sculptures are all on the horizon! The inspiration for my yard beautification project is this section of the city of fort collins xeriscape demonstration garden in front of city hall. Sculpture by Don Mitchell. Spring cleaning! Not so much the housecleaning part, but the straightening, purging, reorganizing parts. I will be moving studios at the arts center soon and I have a little bit of a mural I’d like to attempt on one of the walls — some of my sketchy flowers, lifesize, with a touch of glitter. Hopefully they will banish any leftover wacky mojo and make the room brighter and truly mine. Super excited about that! In the meantime, I wanted to show some detail on my piece “The Wall I Must Scale” since the little picture in my last post didn’t show much. Here’s the bottom part of the wall hanging. I never thought white on white would be so challenging! It’s hard to get a good shot of the whole piece and, it appears to go a bit unnoticed in our gallery, hanging along with all of the colorful works in this year’s Artists in Dreamland. But the more I look at it, the more I like it and I’m glad I tried something new.